So, the good news is that the latest batch of referrals went out today. That means that we move up in line the tiniest bit, and that lots of families are finally getting their first glimpses of their children. Of course, the progress that was made was small...they have matched through September 8, 2005...keep in mind that our LID is April 17, 2006. Depressing, isn't it? So, here's the really depressing part...the CCAA has matched 14 days of LIDs. If it continues at this pace until we receive our referral (approx. 2 weeks of referrals a month), we will receive our referral in January or February 2008. I can't even believe that I just typed that. Let me pause to cry a bit before I continue. Do I really think that it could be spring of 2008 before we see our daughter? Not really. There are many "experts" in the Chinese adoption field who feel that China won't let the wait get that long. The current number that people are throwing around as an upper limit is 18 months. That would bring us a referral in October or November 2007. As sad as that is, I think I could handle that. There are also those experts who think that the wait will speed up soon. This is also possible. The only precedent for the wait getting this long is during the SARS scare. International adoptions stopped for several months, then when they started back they were very slow. All of a sudden, the CCAA started referring bigger groups, and sending 2 groups of referrals a month. The bottom line is that no one knows. If we do have to wait until 2008 for our referral, maybe we will be in China during some of the Olympics...I love the Olympics. It doesn't look like we will have any problem at all making it to Shana & Stephen's wedding in July. I am so excited that I am a part of their celebration, and that we will get to go with our friends to Cleveland to celebrate (and that we are all going to catch a Red Sox-Indians game to kick off the weekend). I will have plenty of time to make our 100 Good Wishes Quilt and scrapbook. Speaking of scrapbooks, I will have time to scrapbook all of our Paris pictures, and maybe even scrapbook our wedding pictures. We will get to go to Ocracoke Island one more time as just a couple. I will have time to paint all of the rooms in our house, not just the nursery! I have made such great friends online in our DTC group (families that all sent their paperwork to China in April)...I am having fun with all the gift & book & postcard exchanges, and it has become a wonderful source of support as we go through the wait. We get to go celebrate my Auntie Edie & Uncle Norman's 50th wedding anniversary this weekend. What an fantastic thing to celebrate, and I am so excited to see all of my family. We get to spend Christmas with Jonathan, Margaret, Caroline, & Colin. There's not much better than spending time with the cutest niece and nephew in the world. We are so blessed to have supportive family and friends...I don't know how we would do this without you all! Have you picked out a name? What is it? What's up with the red bracelet that Mara's been wearing? Have you started to decorate the nursery? Are you registered anywhere? When do you think you may hear something? If we’re lucky, we WON’T hear anything in the next 3-4 months. Our dossier is either about to be in review or is already in review. Not hearing anything will mean that there were no questions, and things are going as planned. What do you mean by “in review”? And what happened to all that paperwork you sent to China? We sent all of our paperwork (our dossier…14 documents, each which was notarized, certified by the state, authenticated by the US State Department, and authenticated by the Chinese Embassy) to China on March 28, 2006. 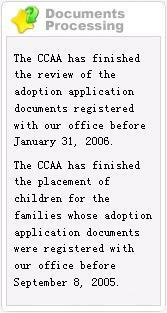 From there, it was translated by our agency’s China office, and delivered to the CCAA (China Center for Adoptive Affairs…the government agency in charge of all Chinese adoptions. It couldn’t be delivered any earlier, as both parents have to be at least 30, and Mara turned 30 on April 2. From there, our dossier was logged in…this can take awhile…our log in date (LID) was April 17, 2006. This is the date that the counting starts (and the date that the CCAA goes by). From there, our dossier waits “in line” to begin the process. It’s been 7 months, and we’re still waiting. From there, our dossier will go into the “review room.” This process takes 1-2 months. The CCAA goes over each dossier with a fine toothed comb, and can contact our agency to ask more questions. They can also deny our application (actually, they can deny our application at any time, and while any dossier being denied is rare, it is EXTREMELY rare to be denied after you pass review). We will breathe a giant sigh of relief when April LIDs come out of the review room! As of today, the CCAA has finished reviewing dossiers with a LID of January 31, 2006. There are rumors that at least a few April dossiers are in the review room right now, so we’re close! (you can see how far the CCAA gets on their home page!). From the review room, our dossier waits some more, then goes to the matching room. This is where we will actually be matched with our daughter! There is a huge backlog of dossiers, so the wait after review can be awhile. Currently the CCAA has matched families whose LIDs were August 26, 2005 or earlier. (yikes!) So we have a ways to go. Referrals generally come out once a month or so…I’ll start posting them here so you can keep track too! After we are matched and we accept the referral, we will wait for travel approval to come to China to complete the adoption. This usually takes 4-6 weeks, and you don’t get a lot of notice…usually you travel about a week after you receive your travel approval! Then we’ll go to China! How much longer are you going to have to wait? I so wish we knew. When we started the process, the wait was 7-9 months. Currently it is around 14-15 months. Some rumors say it is going to stabilize soon around 14 months; others are more pessimistic and say it could extend out to 18-24 months. There's also the chance that it could speed up again. We are being cautiously optimistic…hopefully we will get our referral over the summer, and travel in the fall. I know there are a lot more questions…I’ll type up some more later! And send me any you have so I can answer them for everyone! For now, we’re off to go walk around Burke Lake as part of the 20th birthday celebration of our Temple. And, of course, we have to watch the Patriots-Packers game. Let’s just hope we don’t kill each other over this! I have always loved getting mail. Really. To the point that growing up Elana and I had a schedule to determine whose turn it was to get it so that neither of us would get an extra turn. So it has been SO much fun to go to the mailbox and find quilt squares and wishes for our baby girl! We’ve received squares from old friends, new friends, family, and the Boston Red Sox (no joke…my beloved Red Sox sent us a jersey to cut up and use in the quilt!). We’ve received squares from all over the country and all over the world. And with all the squares we've received, no two squares are the same! It is not too late to send a square and a wish. In fact, I hope you will! We have a bunch of squares (almost 80! ), but still have a ways to go to get to 100. Please keep sending us squares!!! No, I haven't started quilting yet...I need to take a class first! There's one close by that starts in January...that will probably work! I have started the scrapbook of wishes...that I know how to do! It is so touching to read all of them - thank you!